s the 2019 first-quarter ended this week, the U.S. stock market recorded its biggest 1st quarterly gain in about a decade. The major averages wrapped up the quarter strong on Friday with renewed optimism on the progress of trade talks between Washington and Beijing. The Q1 rally had been characterized by three factors: a sharp rebound off the Christmas Eve lows, increasing optimism in U.S.-China trade talks, a sharp reversal in the Federal Reserve’s monetary policy stance, and lastly, signs of a global economic slowdown. For the week, the Dow Jones Industrials netted a gain of +426 points or +1.6% to close at 25928.68. The index is nearing 26,000, and previous highs, more specifically near ~26,200. The blue-chips continue to trade in a range just below their previous highs and above the 50-day moving average. This could be considered healthy technical action and a digestion of the first-quarter gains of +11%. The Nasdaq Composite gained +1.3% on the week and booked its biggest 1st quarterly gain (+16%) since 2012. Since breaking above the November highs in mid-march, the index has remained above that level. The November highs of 7572 would be a point to watch during a potential pullback with the round-750o and coinciding moving average offering more significant support. The S&P 500 index added +1.2% this week closing strong on Friday with some above average volume gains. For the quarter, the bellwether notched its best start to a year since 1998. 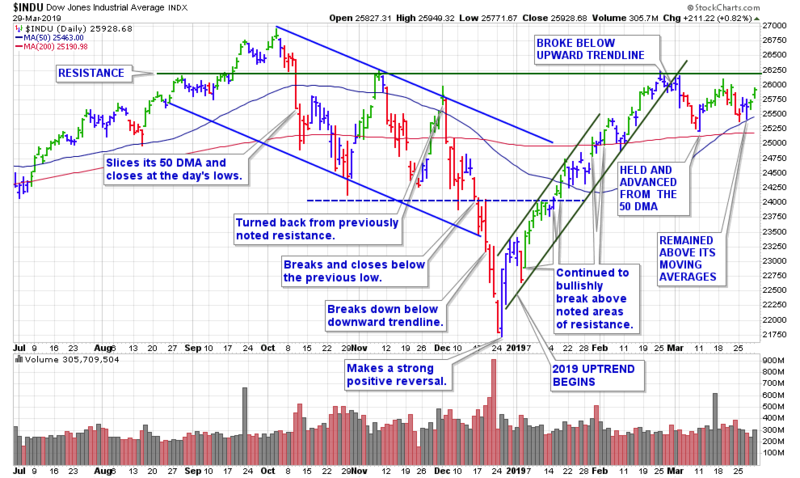 Of late, the index has basically held support of the round-2800. The distribution day count as I understand is now at 6 on Nasdaq, and 7 on S&P 500. 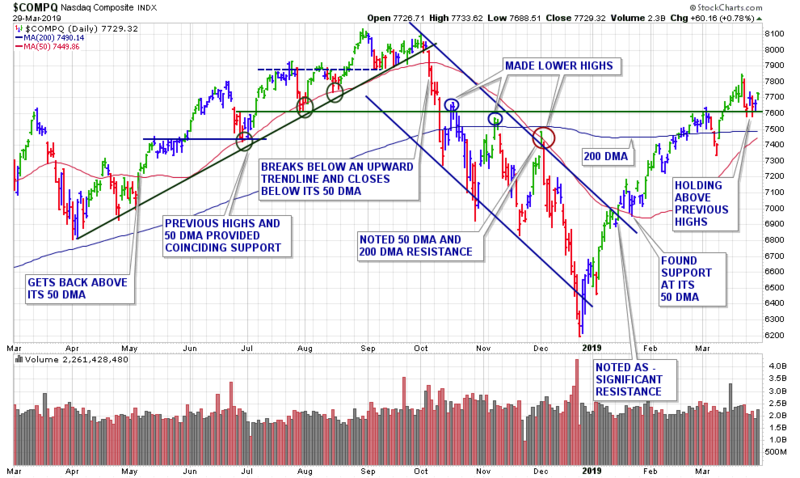 Even with this week’s bullish action, the uptrend remains officially – “Under Pressure”. 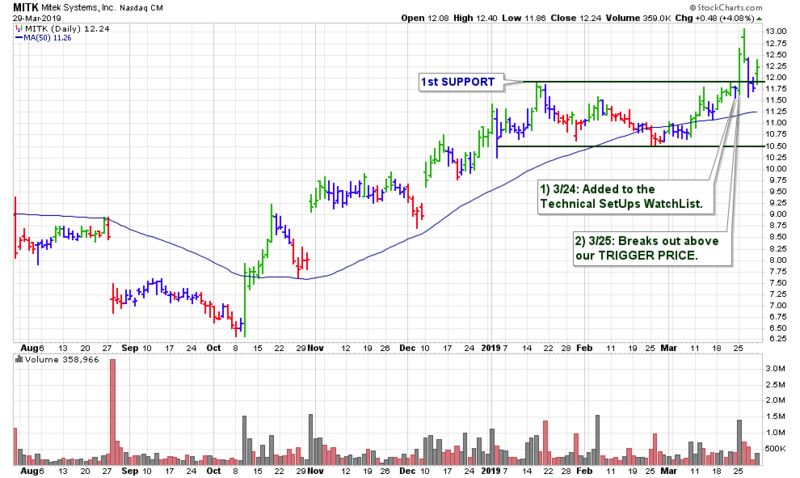 An announcement of a completed comprehensive trade deal with China could be a catalyst to move the market higher and spring fresh breakouts. Now it the time to have your personal watch list ready. 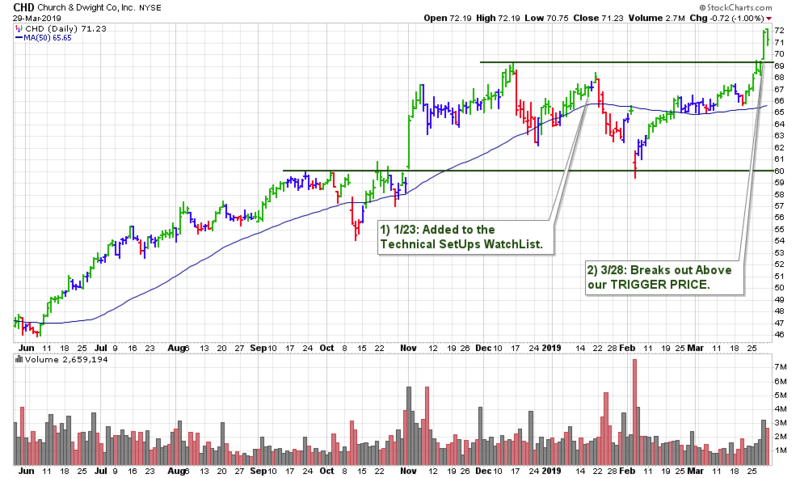 This past week we had 2 breakouts from our weekly watch list of 6 stocks. 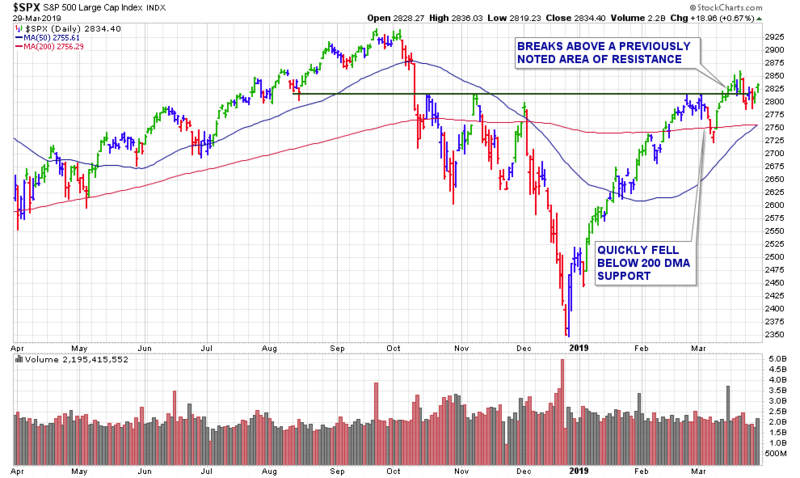 Breakouts continue to be volatile, and last week’s theme continues this past week – negative reversals. for now a second week. all have basically negatively reversed (several on their breakout day) and closed off of their breakout highs. Here is an update on all of this week’s breakouts.